CloudDav is the Storage Made Easy implementation of WebDav with a unique twist, it works over any Cloud mapped to and SME account whether that Cloud is WebDav enabled or not. This is made possible by the protocol adaptors that SME providers to enable public and private storage cloud to be accessible over common protocols. 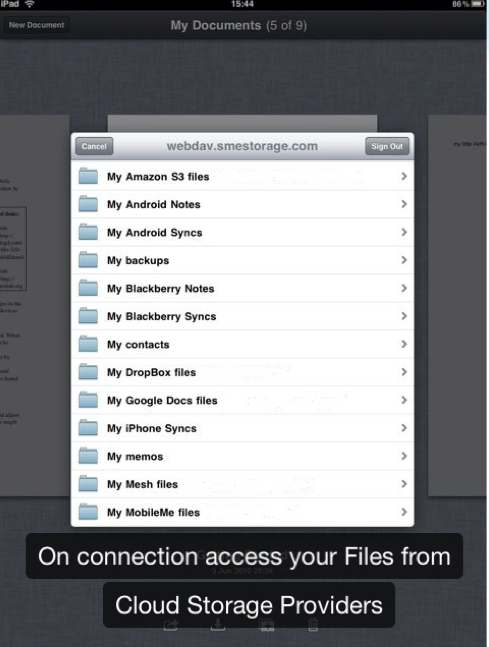 You can use a variety of WebDav clients or Apps to access Files using SME CloudDav. 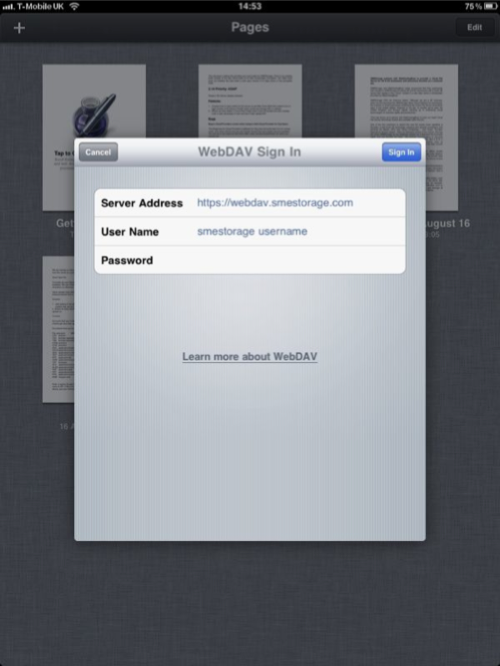 A popular choice on iOS is iWork (composed of Pages, Numbers and Keynote which is Apple's office suite) for the iPad as using CloudDav from Storage Made Easy you can edit files on Google Docs, OneDrive, Amazon Cloud Drive, Amazon S3, DropBox and a whole host of other clouds. 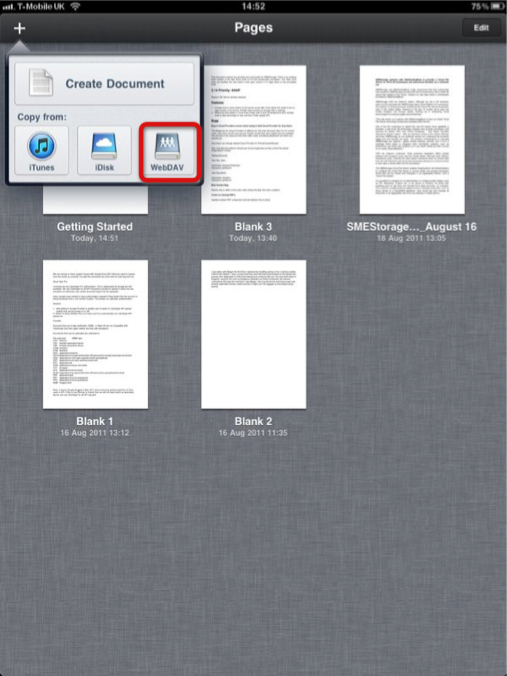 The following example will examine using Apple iWork on the iPad to open, edit and save files. If you added files externally to your Cloud Provider and you cannot see them via CloudDav then you either need to enable the CloudDav real-time refresh from the CloudDav options available from your Cloud Dashboard on the website, or you need to do a manual refresh of your Cloud Files Cache.. To understand how to do a manual refresh please see here. 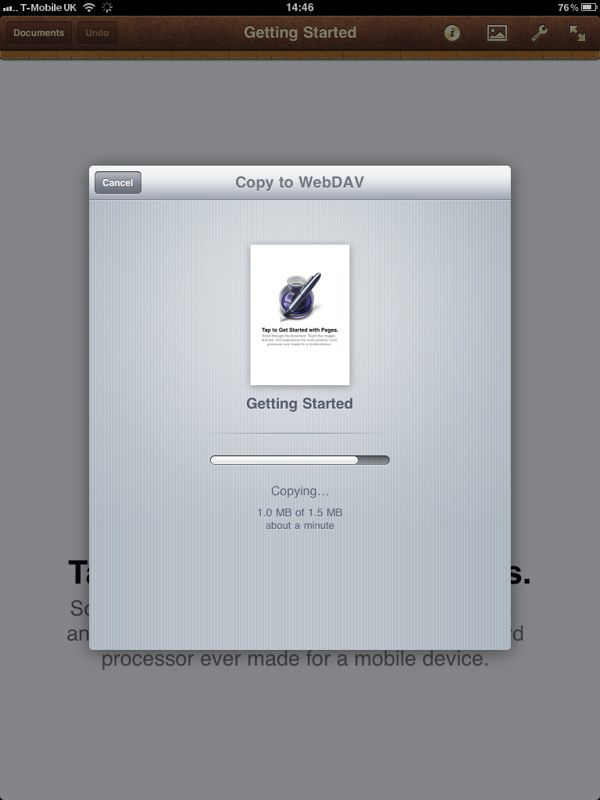 In the later version of iWork there seems to be a bug in which the files is copied but then is copied again (twice). We have debugged this and we see that on the first copy iWork sends the file without Auth headers (authentication) and then when this fails sends it again but with the Auth headers. The save actually works fine, it just takes a little longer. We hope Apple will fix this in a future version. SME Encrypted files that are uploaded where the end user holds the encryption key (ie. 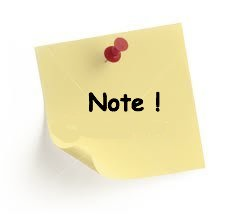 not stored in SME) are not displayed from a WebDav client connection as it makes no sense to show them as they cannot be un-encrypted from a standard WebDav client. If you are trying to map a network drive using SME CloudDav on any version of windows from XP onwards then we would recommend you install these registry fixes that solve many issues with Windows WebDAV, including authentication and correct working with Office 2010+. Once your connection opens, if you chose to open a file will see the cloud mapped to your account. Opening a file to edit from a particular storage clouds is as easy as changing to the correct directory. 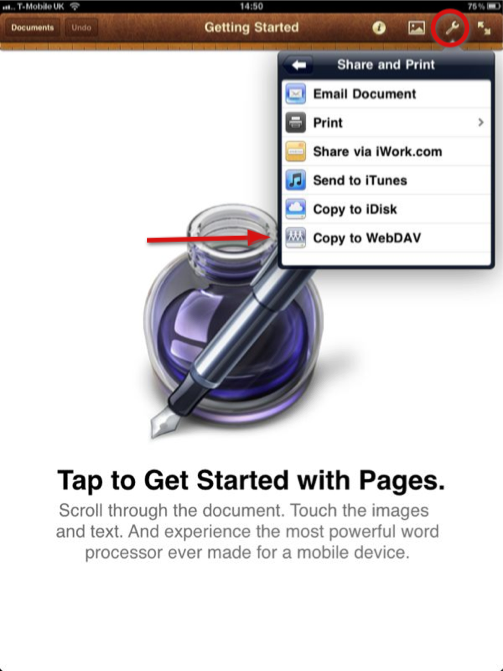 Within the document editing view choose the settings icon and then “Copy to WebDav” to save your changes back to your Cloud via Storage Made Easy. Once you have navigated to the directory and chosen to save Storage Made Easy will connect to your chosen cloud and the document save will begin. There are two options available to be set after login to the Storage Made Easy website and visiting the “My DashBoard” link on the right sidebar. The first option is whether to disable file versioning if using CloudDav. By default this will be set to “on”. When creating or editing files this stops previous version being kept and versioned. 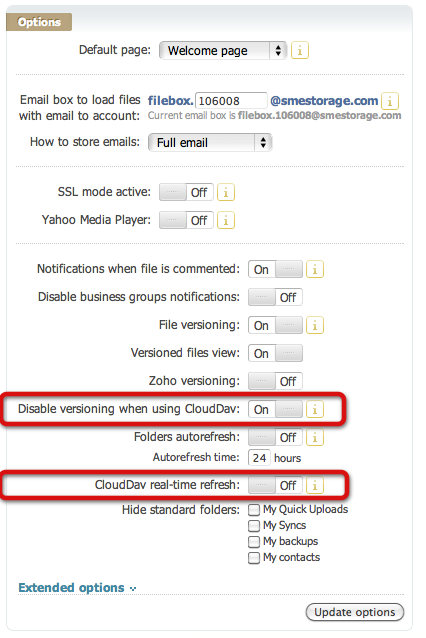 The second option is whether to always update, on access, the Storage Made Easy cache when viewing files over CloudDav. This means that Storage Made Easy will always check directly with the Clouds that you are using rather than using the cache. This has the advantage that you will always see any new files that you added direct to these Clouds but has the disadvantage that it could be slower on the initial view of each directory.